Yesterday, Toshiba showed off a bevy of new laptops across both the Satellite and Qosmio series. With something for everyone, this refresh with Intel’s 3rd generation Ivy Bridge processor will be a huge improvement from the previous incarnations of the laptops. 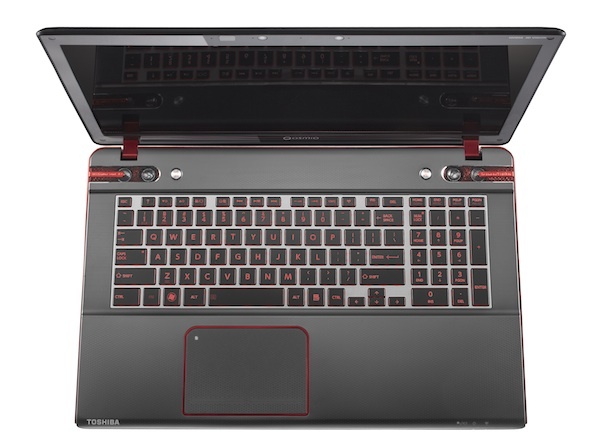 In the spotlight was the new Qosmio X870 gaming laptop, a 3D enabled 17.3inch monster with an Intel Core i7-3610QM Processor, up to 16GB of RAM, 750GB Hybrid Drive (ala Seagate Momentus XT), NVIDIA GeForce GTX670M, Blu Ray writer as well as a Harman Kardon stereo sound system. Also included is gigabit ethernet, Bluetooth 4.0, HDMI support and an illuminated keyboard. The X870 looks like a monster gaming laptop, but of course with no price information at the moment, it’s kind of hard to gauge how good it actually can be. On top of this, Toshiba has also released the new Satellite M800, L800 and C800 models to round out their already versatile range of laptops. Hit the jump for all 3 full press releases!